The data collected are interesting and wide-ranging, with some being stark. 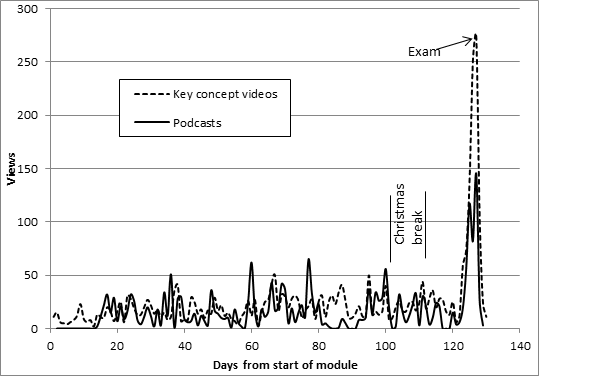 For example the graph below shows usage of pod-casts and key-concept videos again time, guess the date of the exam! Others are more subtle but still interesting. 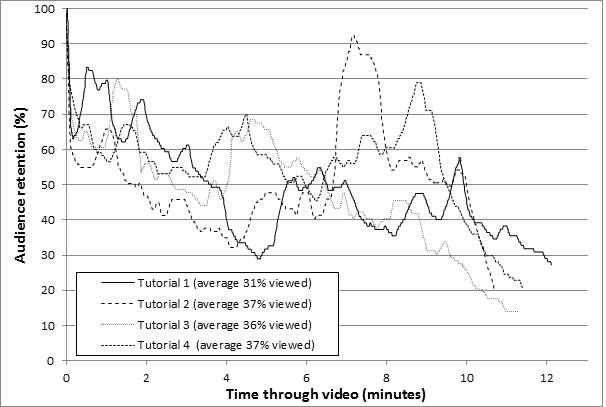 For example the following two figures show respectively the audience retention against time for key-concept videos and tutorial-solution videos. 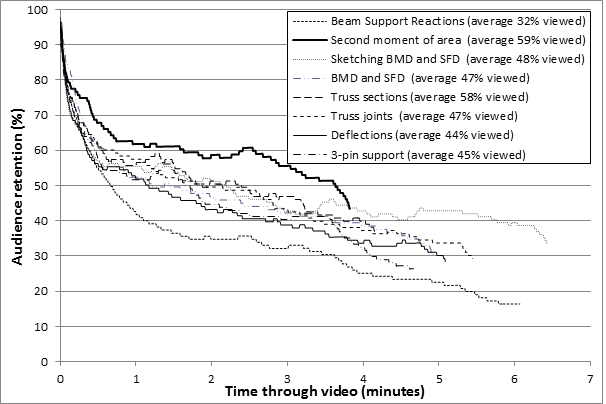 Clearly students use these types of video very differently – the spikiness of the tutorial-solution videos show students jump to specific locations in the video for the precise information they need, by contrast the smooth curves in the key-concept video data shows generally students start the beginning and watch until (near the) end. All types of rich-media are valued by students as they allow for learning at any time and in any place. They also allow repeated viewing of presentations of difficult material – something traditional lectures do not allow. This aspect is also useful for students with certain disabilities. Reduction in attendance at lectures is often cited as reason for avoiding producing media-rich material, particularly lecture podcasts. The effects on lecture attendance are however small (and two-way). Further, concern about lecture attendance is only relevant if lectures are seen as *the* central way of teaching – by adopting a blended learning philosophy and accepting that students will use whichever communication channel is most useful to them, concerns about lecture attendance disappear. Media-rich material is best produced to be as short and information-dense as possible. Five minutes is a sensible upper-bound for a key-concept video because beyond this time it is difficult for viewers to keep focussed. This is very much in contrast to traditional lectures and something academics should bear in mind when producing material, with much existing material on, for example, YouTube, being too long to be effective. This entry was posted in Education and tagged Media-rich, Podcasts, Videos on August 28, 2015 by martingillie. How do UG Engineers use Video Resources?